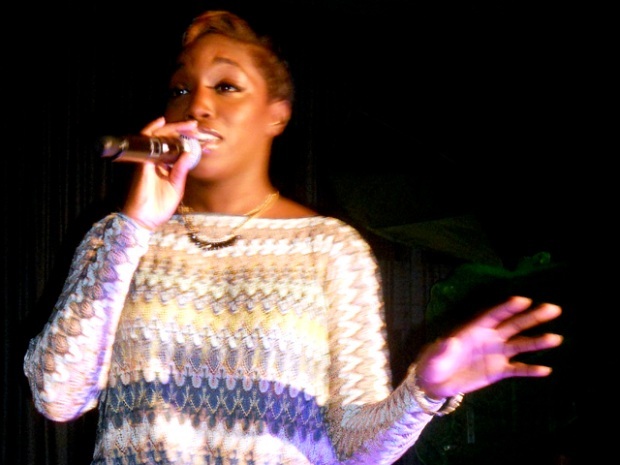 British Beauty Estelle on Kanye:: "He Speaks the Absolute Truth"
British singer Estelle shot to fame because of Kanye West and she isn't abandoning the outspoken and unpredictable hip hop artist any time soon. Despite his shocking interruption of Taylor Swift's acceptance speech at the MTV Video Music Awards, Estelle insisted West was just being himself. “I was surprised by the amount of crap he got. It was like, do you know this guy? Come on now everyone, stop being surprised," said Estelle, who collaborated with West on the single "American Boy." “I don’t think he will have any problems coming back. He speaks the absolute truth, no editing or tailoring. I thinks that’s why every time he comes back everyone is really excited." "American Boy" landed Estelle a Grammy and three consecutive Best Female Artist trophies at the UK Hip Hop Awards. Last night, she performed at the invite only W Fort Lauderdale one year anniversary party. Collaborating with everyone from David Guetta to Sean Paul, it's no shock that the songstress was the first artist asked to be a part of John Legend's new label, Homeschool Records. After touring together, it was her determination, along with her voice, that got her signed. “John Legend is my boss, but its not like that. He is like a brother to me. He saw me perform on stage one time with a terrible throat infection and he was just like, wow – that’s a work ethic,” she said. With her newest album dropping later this year, the singer has been on tour promoting her newest single “Fall In Love” featuring rapper Nas. But not forgetting the song that made her famous, she admits that there is an American Boy in her life. Though her love interest may be American, Estelle's World Cup loyalty is with the English national team.